There’s nothing quite like this time of year in New York. But with all the decorations, the parties, the candy (seriously, it’s a lot), and general madness, deciding what to do can be overwhelming. So we locked down the most fun ways to spend that hard-earned winter vacay time all over the state. Some like it hot, and some like it…ice cold. 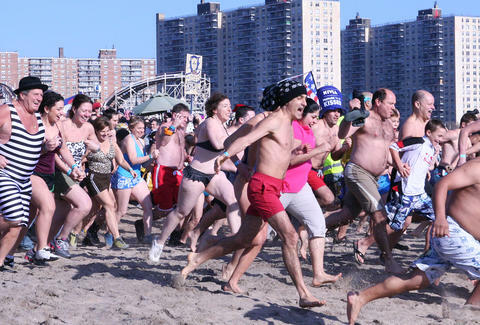 The Coney Island Polar Bear Club hosts its annual Polar Plunge, for the very brave only, on New Years Day, with a suggested donation of $20.00. Freezing your mistletoe off is for a good cause: all proceeds go to raise money for Camp Sunshine, a charity that supports children with life-threatening illnesses, and their families. 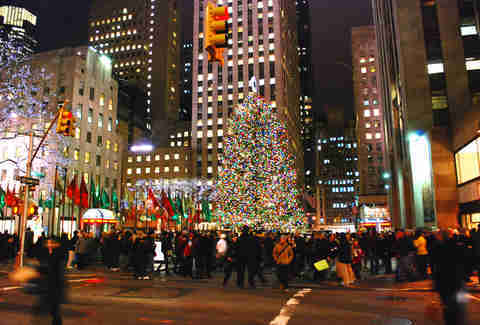 Yes yes, the tree at Rockefeller Center is about as iconic as pizza and bagels in NYC. But show some love to the other awesome Christmas trees in the city, like the Hogwart's-style addition to New York Public Library's Astor Hall. 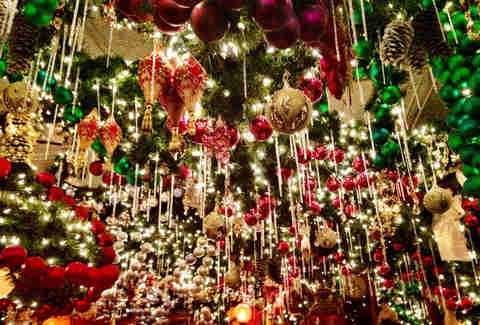 Or take a trip to the Met to see the 20-foot blue spruce, decorated with 18th-century baroque angels. Just because it’s December on the East Coast doesn’t mean you can’t have a little fun in the water. Take a trip back down to your childhood at Hope Lake Lodge and Cascades Indoor Waterpark. It's got a wave pool, body slides, multiple hot tubs, and yes, three-story tube slides. Other amenities include a fitness and leisure lodge, spa treatments and even an old school arcade. Pacman? Don’t mind if we do. Ice-skating is always a good time, even as a spectator sport (especially if you're secretly too scared to go out onto the ice yourself). 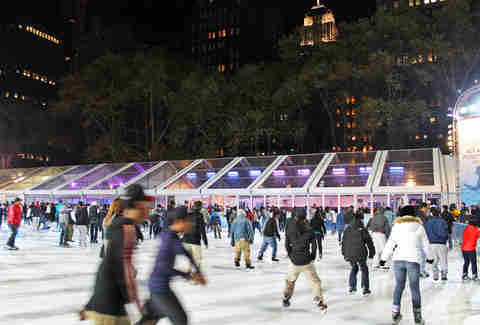 That, along with a custom parka lounge and more than 125 boutique-style shops, makes the Bryant Park skating rink and surrounding area a holiday season must-do. 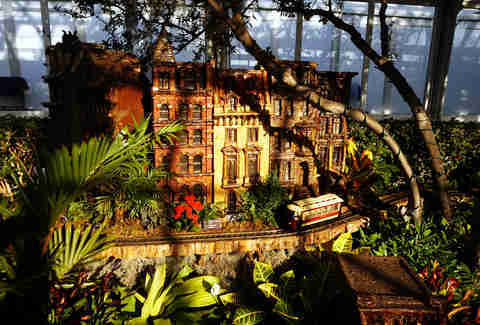 New York State is hardly lacking in winter festivals. For wagon rides, ice-carving contests, and custom dessert making, unleash your inner Martha Stewart at the Jingle Jangle Winter Celebration in Hudson Valley. Pull our your kitschiest holiday jumper for Brooklyn's FUGLY The Ugly Sweater Party, and end the year just right with a holiday-themed burlesque cabaret in Poughkeepsie. While you’re out there having the most wintertime fun imaginable, try your luck with the Make Life Wonderful sweepstakes from NY Lottery. Enter any non-winning holiday Scratch-Off ticket for a chance to win prizes like $500 a week for life. Hey, who knows, it could be you this time around. Why? Because there is not a Murray Hill summer bro to be found at this time of year. 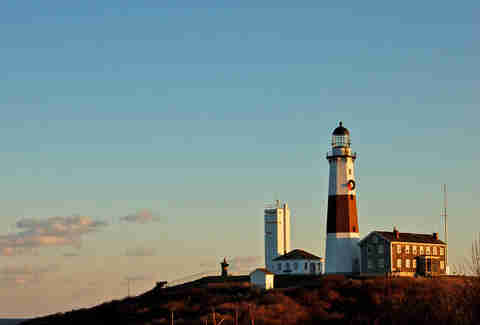 Be sure to hit up the Montauk Point lighthouse, one of the most iconic Hamptons destinations year round. It's extra cool when it’s lit up -- like now. The light flashes every 5 seconds and can be seen a distance of 19 nautical miles. Hip Hop Royalty Doug E. Fresh will host the 37th annual Kwanzaa event at the American Museum of Natural History, with Q+A’s, performances and a tribute to Maya Angelou. After, take some time to tour the museum; it's worth it. Also it’s open to the public! And you know our motto… if it’s free, it’s for me. Sometimes, you need to get punched in the face with holiday cheer while eating, drinking, and being extra merry. Grab a cinnamon-infused holiday martini at Rolf's German Restaurant, which spends more than $60,000 dollars a year to look like Mrs.Claus' Pinterest board. And Molly's Restaurant and Pub already has a cozily festive wood-burning fireplace, but goes literally all out with the holiday lights, like that one house in every neighborhood. Great South Bay Brewery is known for some of the finest craft beer in the state, with a roster of around 20, and... they also throw a killer New Years Eve party. For the price of admission you get a cocktail hour, catered buffet dinner, beer, and a Champagne toast. 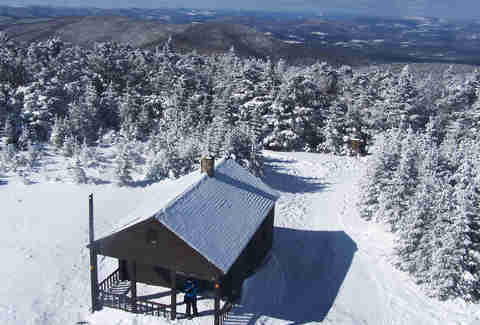 Winter thrill-seekers should head on over Hunter Mountain to zipline 600 feet above all that powder. If that sounds a little too extreme, there are tamer ziplines and canopy tours, though no one will fault you if you sat around drinking hot chocolate and staring at the view. Don't worry about the cold; if you're up there for skiing anyway, you'll be just as warm gliding in the air as you are on the snow. It's the holidays, have dessert! Head on over to Serendipity for their famous hot chocolate, and brave the crowds at Dominique Ansel's Bakery to take home a Chocolate Bûche (that's a yule log). For dessert without a side of tourist, get some old-world Italian holiday treats like the sweet fried Struffoli at Cardinali Bakery or a Polish poppy seed cake, Makowiec, at the Syrena Bakery in Greenpoint. If The Nightmare Before Christmas is your favorite holiday movie, this is probably just the thing for you. While being terrified might not be everyone's typical seasonal activity past Oct 31st, the Adirondacks, Catskills, Finger Lakes, and Hudson Valley have some great haunted attractions -- made creepier by the longer, darker nights. Take your pick from ghost tours, haunted dining and hotels, and UFOs (well, do you know what they are?). If you're going to ski for the holidays, you should do it where the Olympics were hosted. Twice. 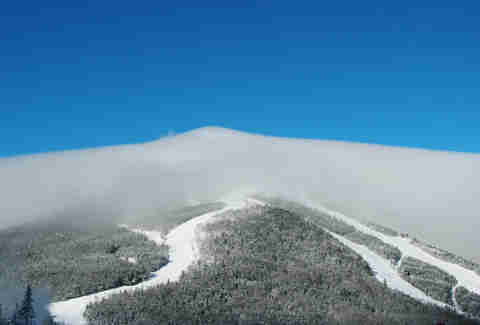 Whiteface Mountain has probably the most challenging runs in the whole state, but also some comfy-cozy ski-lodge action and other activities like snow-shoeing, bobsledding, and touring the Olympic Museum. Pinegrove Dude Ranch & Family Resort's name should be more than enough to get you in the car immediately. The ranch will reform any city slicker, with archery, mini golf, and private horseback riding lessons -- with breathtaking views of Kerhonkson (a killer Instagram post).